London - South Africa had a quiet but disappointing start to Friday's London Olympic Games action, as Tiffany Kruger failed to qualify for the semi-finals of the women's K1 200m canoe sprint. Kruger finished last (seventh) in her heat in a time of 46.122 seconds, four seconds off the Ukranian winner, Inna Osypenko-Radomska. 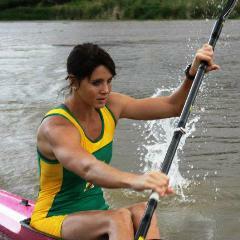 The South African was the only participant in her heat not to qualify for the semi-finals. In swimming, Troyden Prinsloo finished 12th in the men's 10km marathon. Troyden finished in a time of one hour, 50 minutes and 52.9 seconds (1:50:52.9), nearly a minute behind Tunisian winner, Oussama Mellouli. Mellouli bagged the gold medal ahead of Thomas Lurz of Germany and Richard Weinberger of Canada. The South African 4x400m relay team of LJ van Zyl, Oscar Pistorius, Willem De Beer and Shaun De Jager will compete in the final on Friday night.